The countdown to 2019 Elections begin, one undeniable fact so glaring among the populace is a public outcry for real change and a better government for Nigeria. consecutively failed Nigerians and it does seem they can never take the nation to the ''promised land'' no matter how best they try. The pattern of reclycing the old folks in politics has been the bane of African politics which has left the continent underdeveloped, impoverished, in stack abject poverty and a perpetual borrower from western lenders. Nigeria typifies the African state, where the average citizen lives under $1 per day; our leader have plunged the country into economic malfunctioning and serial underdevelopment, a situation that rubbishes our collective image as a people. We c an not continue to depend on mediocres to continue to rule our country with a lack of world vision. Take for instance the issue of electricity in Nigeria. It is true that from the inception of the present republic, the incoming Obasanjo administration took steps to tackle power problem through the NIPP, but that project and a lot of others after that, even with the billions of dollars spent on them unfortunately never brought stable energy to the country. How embarrasing that in the 21st century, our great nation is still unable to boast of 5 hours of elecricity each day. This situation has led to epileptic economic performance of our industries and has discouraged young enterpreneurs from going into industrialization. We have a model in place which will solve the problem of electricity in Nigeria forever. Once my administration is elected, we are going to instal the best electricity machinery that will provide 24 hours of electricity to Nigerians. Citing the education sector, it is only in Nigeria the world over where the story of strike actions by lecturers make healdines every other year. It is a shame and we must apologize to these young Nigerians, the students, the undergraduates who are the real brain power of this nation. It is unheard of that in any nation, the kids would be asked to get packing and go home, simply because our government has refused to pay the teachers or has blatantly turned their back on agreements reached between the government and the staff union for the betterment of the education sector. This action is anti people, anti progress and must be stopped forthwith. Our president routinely travels to the United Kingdom for medical attention. Why? Simply because he has no confidence in the health sector of Nigeria, so he has to get help in another man's country. How unfair that is to the rest of over 140 million Nigerians who can not afford medical help abroad? According to the presidential candidate, Mbonu this situation can only be remedied when we revamp our health sector. Honourable Mbonu, who made this declaration at a World Press Conference in Abuja, said Nigerians need a country that is secure, adds value, and not strife to the rest of the world. He said his leadership would focus on Security and Related Infrastructure, Electricity and Related Infrastructure, Healthcare, Agriculture and Related Infrastructure, as well as Youth Education. Sam Okey Mbonu's global credentials are unmatched by any other candidate in the 2019 presidential race. 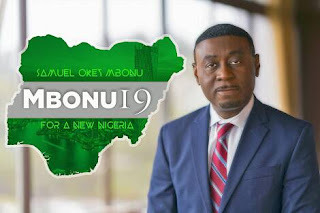 Described by western media giant, CNN as ''a very powerful voice on Africa'', Mbonu provides astute advisory and supporting roles to public and private institutions and agencies in the United States of America. He is also the Executive Director, Nigerian American Leadership Council, a washington DC-based think tank focusing on providing investment advisory and solutions to USA-Nigeria companies and helping to build bilateral relations and policies between Nigeria and America. Mbonu has helped the United States of America formulate policies and projects that have recorded huge successes through the United States Congress. Mbonu's meritorious services as a state commisioner in the state of Maryland USA (commissioner for Housing and Urban Development) also led to his appointment as the chief media analyst on CNN, CNBC as well as other western media giants where Mbonu plays advisory roles to the US congress, thereby deepening relations between the United States and Nigeria. With a man as brilliant and internationally experienced in public administration and coporate leadership as Sam Okey Mbonu is, Nigeria is bound to leap in terms of economic fortune and job creation. The presidential hopeful hinted that he would utilize his wealth of experience and connnections in the United States to attract Foreign Direct Investment (FDI). 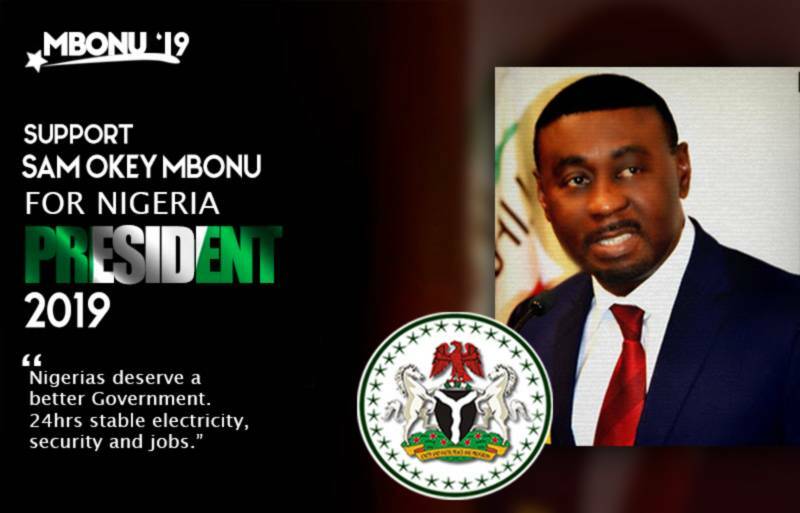 According to Mbonu, Nigeria is a choice destination for foreign investors once the issue of electricity and insecurity are fixed and he will be focusing on these two aspects in his administration. Finally, Mbonu hinted that he would declare a state of emergency in the power sector, where he would double as minister of power, until the isssue of power failure is nailed to the bud.